Discover and understand your own capability for change. Learn to learn. Reflect on and think always about your communication – what you need to say, how you want to say it, why you want to say it, when you need to say it, and how you will know that what you have said has reached the mark. Learn to make communicating integral to who you become as a change manager. Learn to become authentic – whatever it takes. Learn not to hide. Encourage and recognise and reward authenticity in others, always. Learn to see organisations as living systems, real communities made up of complex relationships and dependencies. Understand grief – in all its complexity. Learn ‘to be’ and don’t avoid grief. Both people and organisations grieve. Learn how to listen to people instead of talking at or telling them. Learn how to invite conversation, dialogue and storytelling. Understand and appreciate peoples’ limitations. Realise that people learn at different levels and in different ways. Appreciate peoples’ different learning styles. Help create environments where there is trust and openness and engagement with people. Let trust become part of business as usual. Be trustworthy yourself. Study the power and art of listening to people – listen. Reflect deeply about ‘motivation’ – your own and others’ – continually consider this aspect within people. Reflect on motivation compared to consequence. Consider yourself as an elite athlete. You are not alone, you require coaches, mentors, nutrition, physical therapy, encouragement, rest and recovery and of course results. Treat your own organisational change management capability as that of an athlete. Find your mentor within the organisation. Understand that change is always a journey, learn to look for road blocks along the way. Learn techniques to get to the truth. Learn to travel well. Understand and appreciate that people absorb information differently, and at different rates and at different levels of understanding. Learn never to assume that people have ‘heard and understood’. Realise and appreciate that organisational change is messy and ambiguous, learn to ‘get over it’ – learn to live comfortably with ambiguity, confusion, not knowing, failing. Don’t be ‘too precious’. Study and appreciate the strengths of two aspects of organisational change: the scientific intellectual approach, and the emotional approach. Learn to become familiar with and comfortable with both aspects. Discover and learn to appreciate that change is forever and ongoing and constant and continual. Change is not going to ‘go away’. It never has and never will. Find out what the current state with change is first by talking and listening to other people. Learn to listen well. Talk to people. Learn to talk to people and learn to enjoy talking to people. Know where you are and where you want to get. Reflect and think. Understand deeply what you are trying to change and why. Activate a change management network to help support your effort. Nurture such networks. Consider the power of EA and PA networks within organisations. Consider the organisation in which you find yourself – similarly as an athlete requiring all the above support. Continually reflect on the systemic nature of this organic and alive organisation. Learn patience, tolerance, and a sense of humour. Identify staff that support change and encourage them to support their peers and leaders – identify senior leaders who support change and encourage them to support their peers and staff. Look for and recognise early adopters, ask them to help you. Discover and understand your leadership/managements’ capability, capacity and willingness for change. Learn how to find their strengths and their weaknesses for change. Learn how to build their capacity for change – as well as your own. Know that organisational change takes time, energy, determination, drive, leadership, and even failure. Learn how to help leadership/management understand that change takes time – considerable time. Appreciate that people at different levels in an organisation will have totally different perspectives of the proposed changes. Senior managers may consider the change through rose tinted glasses; staff on the ground may not. Understand where you sit on this hierarchy. Do you align with senior management or with ground staff – or somewhere in between. Learn to see, understand and respect all perspectives. Understand and appreciate the power and relevance of stories. Discover and use stories to make sense of change for yourself and others. Conversations build stories, people need stories, and people use stories to make sense of their world. People learn through stories. Learn to use stories. Find examples to prove/cite changes and benefits achieved, show ‘this is what it looks like’ through your examples – don’t recite theory. Learn to collect and use real examples. Listen actively to the scuttlebutt and myths developing – learn to identify and reflect on the underlying causes and emotions behind the myths. Learn to address myths promptly. Acknowledge and name the rumours publicly and address them proactively (and empathically). Learn not to ignore them. Help people learn to see their results of change for themselves, recognise their efforts and step-by-step achievements. Always look out for achievements and showcase each effort and result. Learn to help people think about ‘consequence’. Separate ‘technical problems’ from ‘complex problems’ – learn to appreciate the difference and treat differently. Technical problems include systems and process, and are different from complex problems: changing human beings. Look for ‘quick wins’ to build credibility, relationships and profile, and to help find those like-minded colleagues. Learn who all your stakeholders are – both internal and external – their names, roles and expectations. Learn how to engage with your stakeholders, listen to them, involve them, and learn how to show them the results of small first efforts as well as large benefits. Learn how to talk to them about success and failure up front, early and often. Ask your stakeholders for assistance early. Don’t hide failure from your stakeholders. Learn to tell your stakeholders the honest truth – always. Help them make sense of the changes required. Learn the lessons of failure. Openly discuss and study failure. Expect and respect failure. Reflect on the adage ‘fail early and fail often’. Learn from failure. Learn not to fear failure. Make failure visible early – do not hide failure. Change is messy – you will fail. Recognise and acknowledge small steps of achievements – even amongst failure. Stop trying to convince people – there is no perfect argument that will win people over, if they don’t want to change. 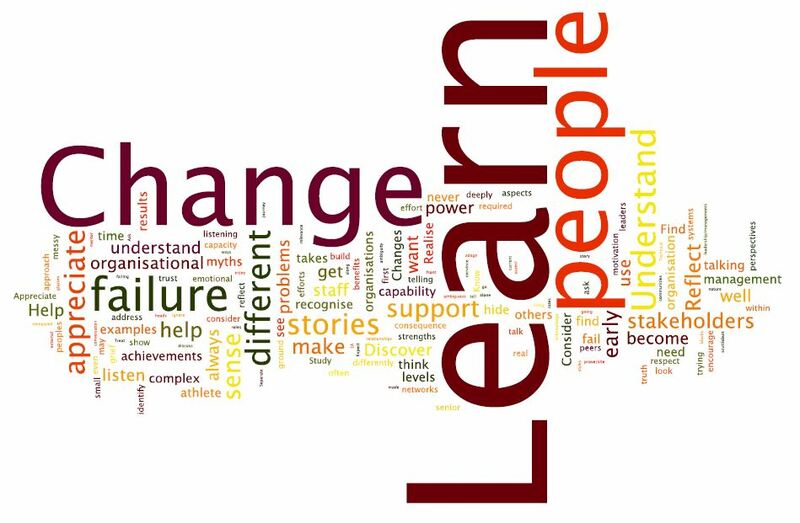 Help people learn to change through their own insight – not power. Understand that an emotional reaction to change in people is required if you wish to succeed. I think it’s all there. What strikes me is that if you can embody these values the group will become a refuge and an authentic place where people can connect back to a true holistic, integral, values-driven approach to life/change/work etc. Also seems to be a community that assists people in their meaning-making journey. I like it Jude, good work in terms of creating a “wish list”, now for the work of actualising it as a community culture; aspirational, yes, difficult, yes, worthwhile and best-practice, absolutely. I would be interested in joining this group. How do I get more info? Hi there! To join our group, please send through your contact details via this blog’s ‘Contact’ page. Excellent thinking and I agree with mcshane – now we have to make it happen. Jude – thanks for sharing the thinking of your group – it is a very useful outline that will serve individuals and teams well should they choose to use it. Very comprehensive and well structured! Thanks to you and your group. Every part of the post is important and fits together well. What stood out for me was listening (mentioned three times) and storytelling (also mentioned three times). These are the cornerstones of success. Powerful insightful messages, excellent thinking areas, finally it brings it all in. Will definitely be using and promoting all of these areas. Brilliant. Thank you – I liked the way this was broken into the respective areas. The challenge of course always lies in implementation. One of the greatest challenges I have found has been that staff are always at different stages of acceptance for change. Which makes your comment re change being messy very accurate! Wonderful synopsis and groupings. I’ve added it to my ‘Change Leadership’ scoop.it collection. Excellent article. Very accurate. Specifically I liked the comments around ‘failing’ and believe this to be so true from my own experience. Thank you for sharing. Very well encapsulated. Agree with Jennifer and others that the failures – which will happen – need to be acknowledged and used to learn. The concept of a safe-fail (in which you learn from the attempt, even if it fails) is powerful but somewhat scary to contemplate in some organisational environments.